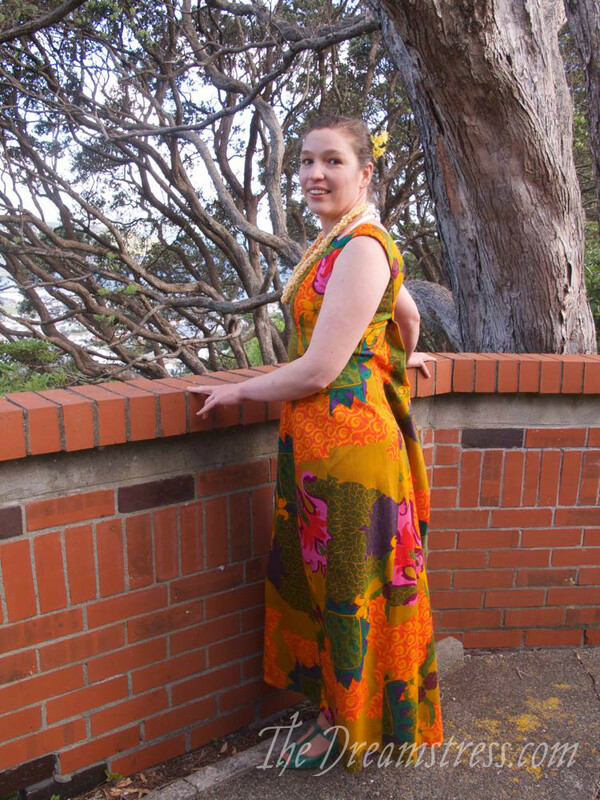 I’ve blogged about almost everything I wore to Costume College this year, except one: the one thing that was actually on-theme (1960s), and that I didn’t make. I thought I’d give myself a break from corsets on Sunday, and wear a nice loose, flowing dress. 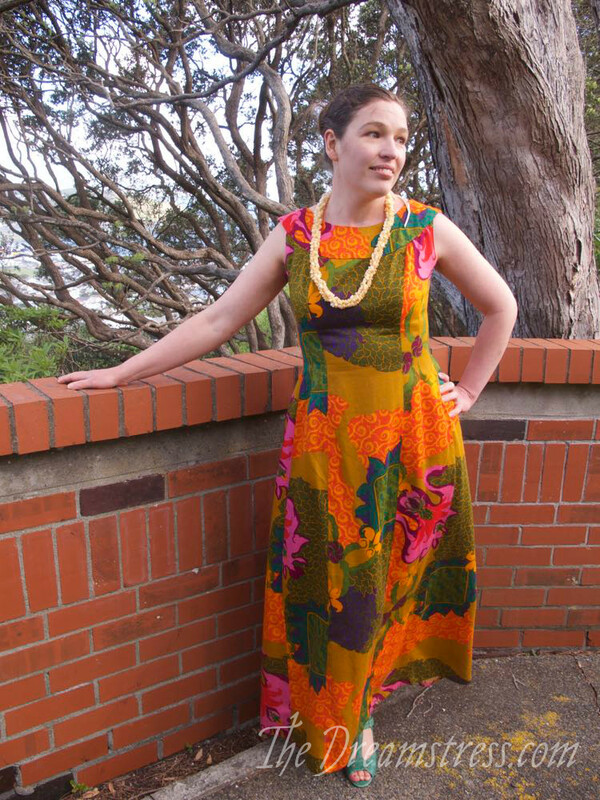 Something that was both 1960s, AND fit the class I was teaching on Sunday: Tapa Cloth & Tiki Attire: the Pacific Influence on Fashion. Ironically, despite choosing it for comfort, this dress was the most least comfortable thing I wore all Costume College. Every commercially made Watteau-backed Hawaiian dress that I find seems to have been cut for someone who was 5’3″. The bust is too high, and the waist is too high. The armholes dig into my underarms and force my shoulders back to a really unnatural angle. 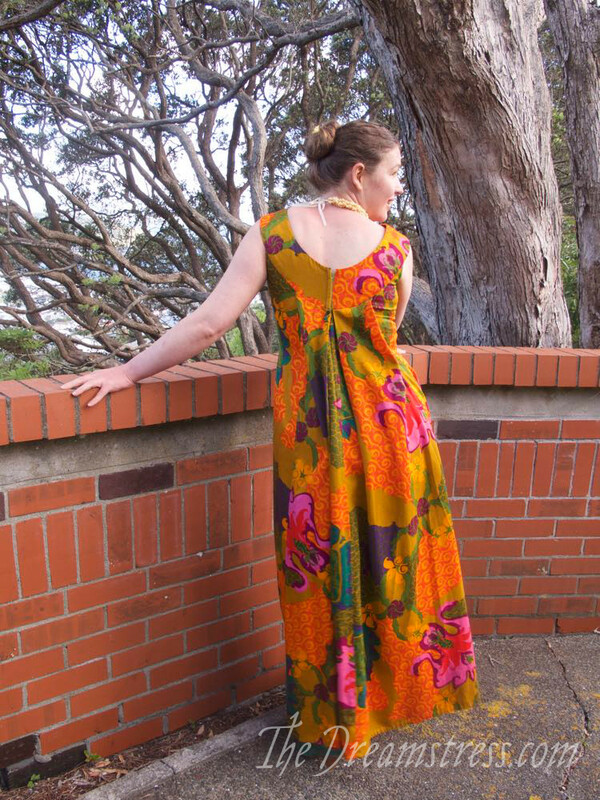 If you’re thinking that ‘vintage 1960s Watteau-backed Hawaiian dress’ is a very specific description, it is, but they were a ‘thing’ from the late 60s to the early 70s. I collect them, because they are the perfect intersection of my Hawaiian background and my historical costumer background. I found this one in a vintage store while visiting Lauren of Wearing History after last Costume College. The incredibly vivid, almost over-saturated colours are so fabulous. It’s my first Waltah Clarke’s dress too! In Hawaiian dress terminology, you’d call this a holomu’u. 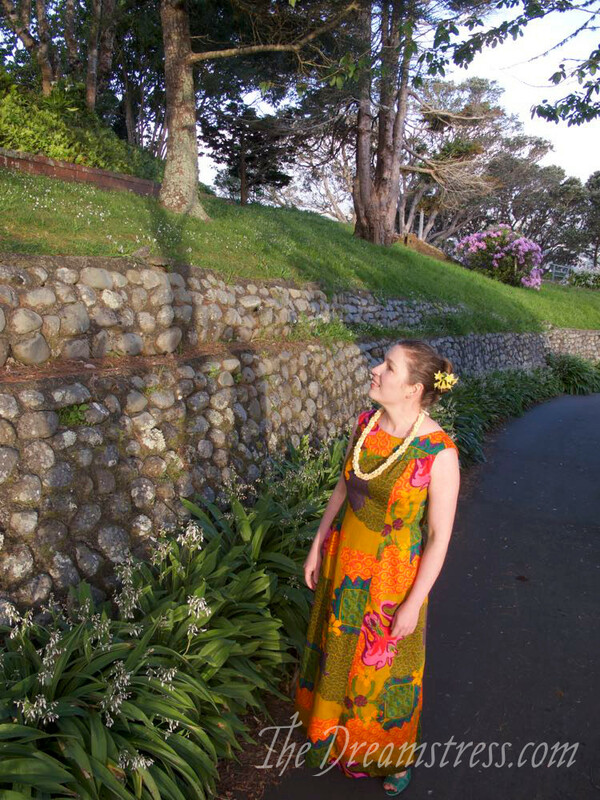 It’s more formal than a mu’umu’u, but less formal than a fitted, trained holoku – the most elegant of Hawaiian gowns. I thought I was being clever and original wearing this at Costume College, but holomu’u were a popular choice – particularly for the Friday Night Pool Party. So mine was a bit anti-climactic by Sunday! There were some gorgeous examples. I was very tempted to see if anyone was willing to sell theirs after Friday, but I restrained myself. (It was hard). 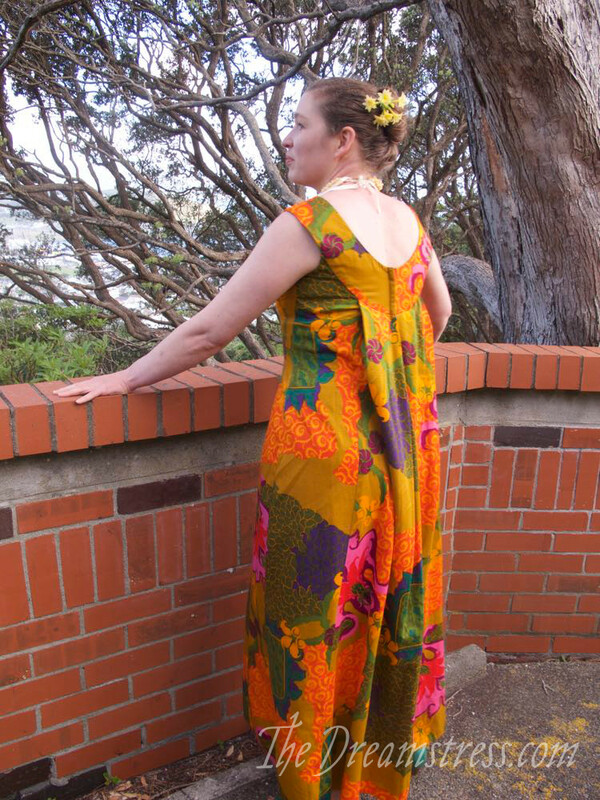 I was in such a rush at Costume College, racing between all my classes (I taught waaay too many hours of classes), that I didn’t get a single photo of me wearing this dress. So once I came home and it warmed up enough to make bare arms advisable (barely, I still turned rather purple during the photoshoot) Mr D and I went out and got some photos. It wasn’t quite as romantic and paradise-worthy as my ‘Watteau in Paradise‘ photoshoot. Hence: ‘almost-paradise’. Please keep me in mind if you see any of these out in the wild at at a reasonable price-point. Especially if they are made for someone who is about 37-30-41 and 5’7″! I’d really like a few more for my collection! So pretty! 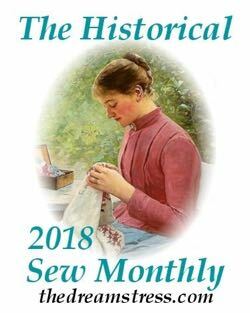 The fabric is stunning and I love the Wattau pleats, although I can see it does look as if it’s cut oddly high under the arms. Is it possible all these dresses were based on much the same bodice block, and maybe it wasn’t an entirely optimal one? I’ve made a mental note to keep an eye out for these for you. What a striking dress! Shame about the complete impracticality of the fit. & I have to say that class sounds fascinating. Perhaps this is the seed of a future pattern for Scroop? I’d buy a pattern for a dress like this too! Me too, I was going to comment the same thing. Agreed, I’d love a pattern for a dress like this! I made this for my mom around 1972 I think. It looks gorgeous on you! My mom’s dress, which I saved, was 1970’s “mod” colors of hot pink and orange! Gorgeous dress! Perhaps the reason the 1960’s dresses don’t fit is that sizes were different then; and what was then a 14 is now an 8? Or something like that. I got married in 1988 and wore a standard pattern size 10, which is still standard, but comparable measurements in ready to wear are now a 0. Incredible! I can’t remember exactly when, but sometime in the 70’s pattern size measurements were changed/updated. And ready to wear sizes have changed many times and become rather mushy. My wish is that all clothing and patterns would be sold according to measurements, not some arbitrary size number. A 36″ bust is always going to be 36″! 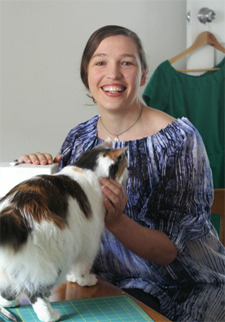 I have a dress that seems to be “none of the above.” Made from bark cloth, it’s a fitted sleeveless floor length sheath dress, and it has a long panel that buttons onto the upper back. Not really a watteau, not really a train. Does that style have a name and a place among Hawaiian garments? Lovely dress, sorry it doesn’t fit right. 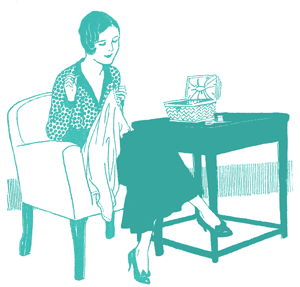 I have the opposite problem-things are all too long, which is why I sew. 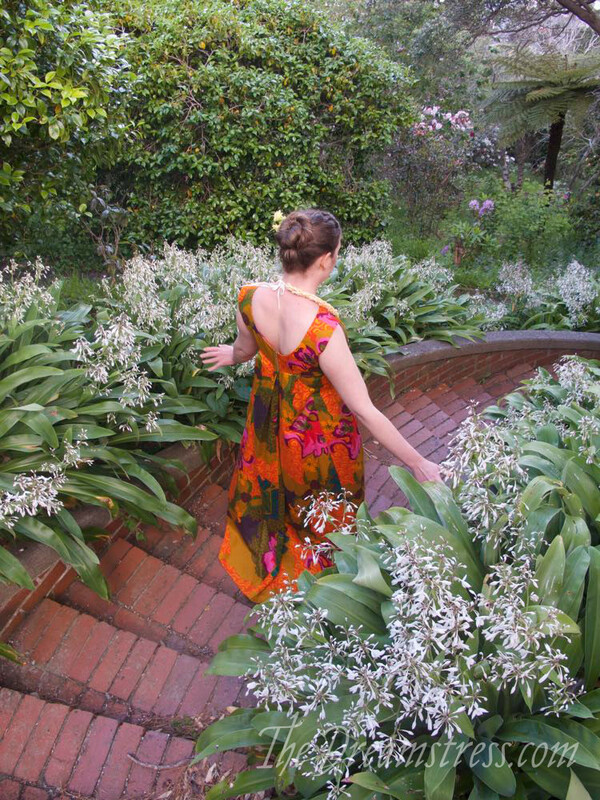 I revisited your Watteau in Paradise post, and was wondering if you are still looking for that Pacifica pattern, since I have one that I’ve never used (up to a 16). I love this style of holomu’u! It suits you so well. I have a vintage pattern with one of the views in this style. I want to get something beautiful from Islands Fabric to make one! Oh, sorry for the double post. Could you please delete the first one if you have time? Thanks. 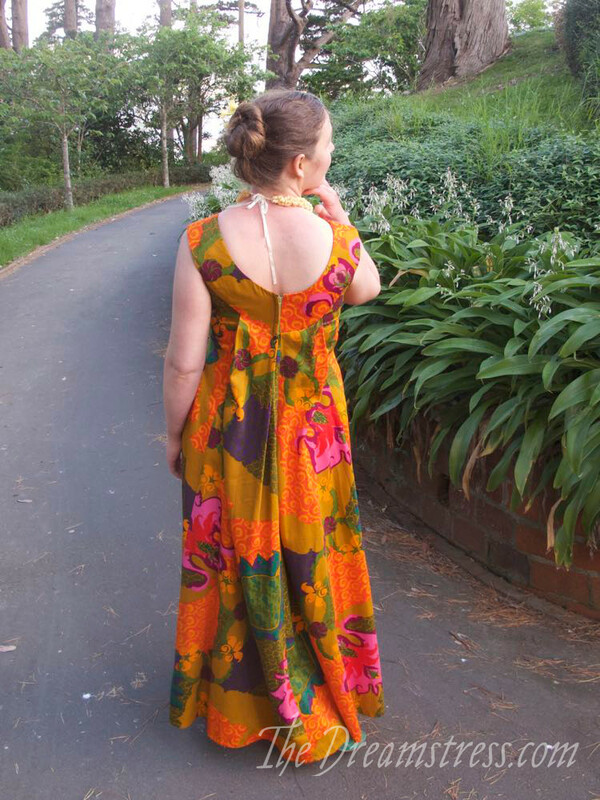 This dress is, beyond a doubt, the loveliest Hawaiian gown I’ve seen. 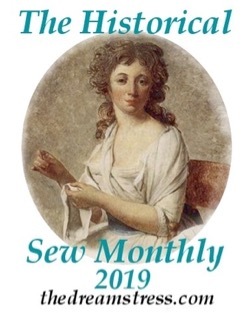 After I read your post, I looked for other holomu’us and holokus on line, but I didn’t find any gowns I thought looked nearly as lovely (maybe because I didn’t see another gown with Watteau pleats). Just a comment on dresses in the 1960s & 70s. first of all as mentioned sizes were smaller then & so were women & girls, 34in bust was considered the norm also 32 in. You had a job to buy anything over a size 14 whereas now a 14 or 16 is the most popular size. Nutrition has improved immensely since world war 2 so women have become larger & taller. The cut of clothes then was different much narrower & with very narrow cut set in sleeves. Not surprising then that it didn’t fit you as you’re a normal slim 21st century gal! I always thought I was too fat then & I wore a size 10. How did, I get into those clothes. Take a look at pictures of normal women then & you’ll see the style. 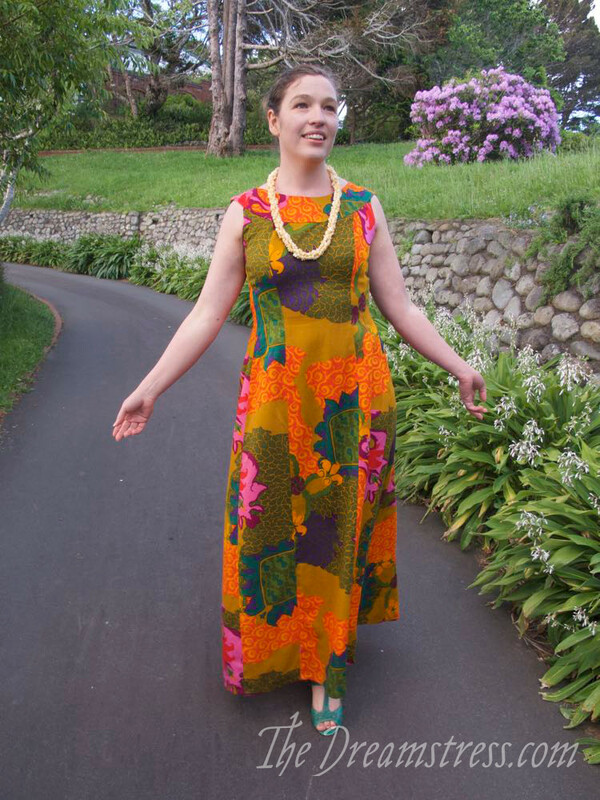 I own and wear a lot of vintage clothes – most much earlier than the 1970s, and the fit problems are only something I encounter in Hawaiian dresses of this era, so it’s not a question of my size in relation to vintage sizes. It’s simply that commercial Hawaiian dresses of this era were cut to quite a unique body shape, and it’s not one that works for me. The ‘people in the past were smaller’ is not necessarily true. My mother was wearing late 60s & 70s clothes when she was only a bit younger than I am now – and my mother, at every age, was bigger than I am: taller, with broader shoulders, wider hips, and bigger bones. My grandmother (born in the 1910s) was also bigger boned than I. She had less body fat as an adult, because she had TB & then cancer, but still wore a larger size, because her shoulders were wider than mine. I find vintage clothes that are much too big for me all the time. Women, on average, were smaller, but there were still PLENTY of women that were much larger than I am – and I’m not a particularly small woman. Ah … the “Gidget Goes Hawaiian” influence? She was 5’0″. They are a lovely flowing style if you can find one that fits. I had a pattern for a “muu-muu with back pleats” when I was in 8th grade that might have been this style. Unfortunately for you, it was for a required sewing project and I burned dress and pattern that summer.